The Roman emperor Hadrian (117 - 138 CE) was one the most important admirers of Greece and during his reign many major public works were constructed that have left their mark on the city of Athens. 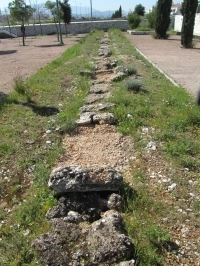 The Hadrian aqueduct was one such project. 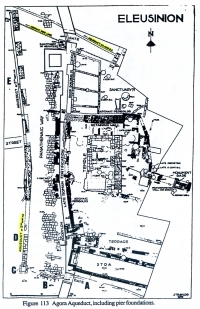 Some scholars surmise that one of his aims was to serve the new Hadrianic quarter of the city (the 'City of Hadrian' or Hadrianopolis) southeast of the ancient city - which covered current Zappeio, and extended from Kalimarmaro up to the Parliament building. 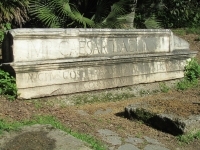 The Hadrian aqueduct was started in 125 CE on the orders of the emperor and completed fifteen years later (140 CE), during the reign of Antoninus Pius. 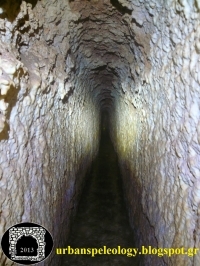 The aqueduct consisted primarily of a masonry channel in an underground tunnel, almost 20 km long. It is significant that the aqueduct was made to collect water not only from the initial source, but also to pick up additional quantities from other sources along the way. 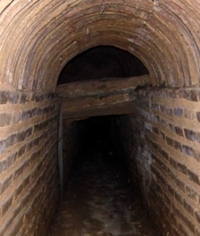 For this reason, branches of the water-carrier and supplementary tunnels were created. 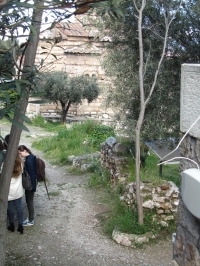 They carried water from other springs around Halandri, Kokkinara, and Kithara Monomati. 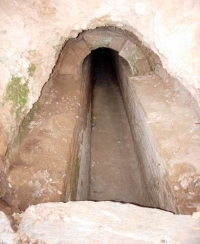 The aqueduct tunnel was constructed manually through solid rock by hundreds of workers, probably slaves, using simple tools such as chisels and hammers. 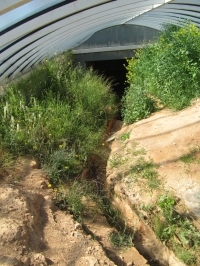 The underground tunnel sections were constructed in rectangular shaped venues with an arched cover, 0,7 - 0,8 m width and 1,1 - 1,6 m height, partly under the water table. 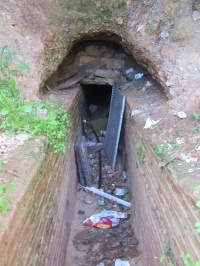 At 33 - 37 m intervals, almost 400 square and circular shafts (access points for cleaning and ventilation) were created. Its gradient was 0,38%: a fall of 75,5 m on a length of 19.684 m between the Olympic Village and the Lykabettos reservoir (Leigh 1998, 46). 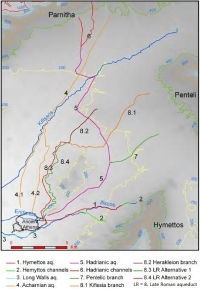 Chiotis 2012b estimates the flow rate during of the aqueduct during the last century as 7.000 m3/day. 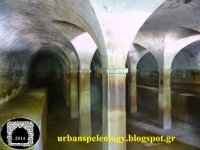 "It is expected though that the flow rate might have been higher in antiquity, as there was water input from the river [Kifissos] itself, as commonly was the practice with Roman aqueducts". 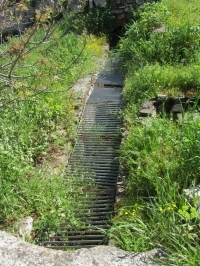 The Hadrian aqueduct began at the foot of Mount Parnes in the area of Tatoi, and collected more water from the Kifissia river. 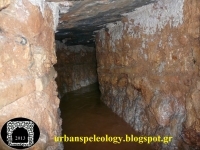 Parts of the aqueduct are still preserved in the Olympic Village (channels & tunnels) and elsewhere including underground sections in Marousi, Halandri and Neo Psychico to a depth of 10 to 35 m. The water was transported by gravity to a stone reservoir on the hill of Lykabettos in the city of Athens. It transected the present-day municipalities of Acharnes, Metamorphosis, Maroussi, Neo Ionia, Neo Psychico, Neo Philadelphia and Ambelokipi. 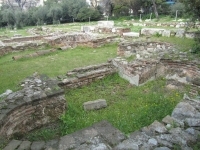 Excavations within the area of the Olympic Village, prior to the games in 2004, have unearthed many remains of Hadrian's aqueduct. Following the route within the Olympic Village, we see two separate surface conduits emerging from two different locations on Mount Parnes. One of these, which runs NE-SW, joins the other, which runs N-S, from which point the now single conduit continues on southward. In about the centre of the Olympic Village the surface conduit bends sharply downwards and disappears underground (coordinates: 38 06 40.06N and 23 46 05.77E). Its route from this point on is marked by shafts constructed at regular intervals, until it clears the Olympic Village. Two secondary underground branches, similarly marked by shafts, converge with the central conduit at the point where the system goes underground. One of these runs NE-SW and is parallel to the first surface channel mentioned above. The other runs E-W. It is unclear which of the channels are of Roman origin. 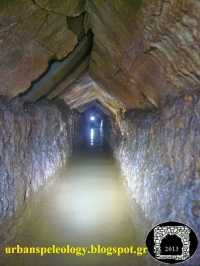 For the result of a search expedition to the origins of the different channels and tunnel, see R.J. Horne's website. The rehabilitation of this monument is designated to preserve it and integrate it in everyday's life of the local community. The Lykabettos reservoir / nymphaeum / distribution basin after reconstruction. Photo from 1925. The destination, the Lykabettos reservoir with dimensions 26,10 x 9,10 m and 2 m deep), had an initial storage capacity of almost 450 cubic meters of water. That is too small to act as a real reservoir compared to the major reservoirs attached to other Roman aqueducts. 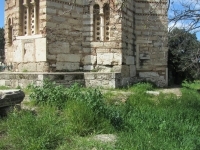 It is situated at 136 m asl with coordinates 37 58 44.26N and 23 44 29.94E. 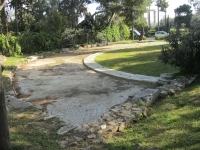 completed and dedicated the aqueduct which had been begun by his father the divine Hadrian in New Athens″. Translation by S. Leigh (Leigh 1998, 107). 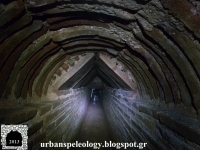 This Lykabettos structure acted as a kind of nymphaeum, as a settling, and as a distribution basin. Now the Greek orthodox rite of the Blessing of the Waters occur in front of the reservoir on the 6th of January each year. We are quite ignorant about the distribution of the aqueduct water after it reached the Lykabettos reservoir. Only scattered masonry conduits, pieces of ceramic and lead pipes have survived. Leigh (1998, 153-8) gave an overview of 14 sections of open conduits. One surmises that nymphaea and in particular bath houses will have profited from the aqueduct water. Leigh made mention of three nymphaea amoung which the nymphaeum in the Greek Agora, and 35 bath houses from the Hadrianic period and later, like the bath houses north of the Zeus Olympieion and the one in the SW corner of the Agora. 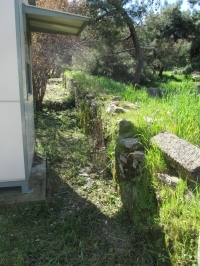 The coming in of the Roman aqueduct of Hadrian in the SE corner of Athens Agora (outside the fences). 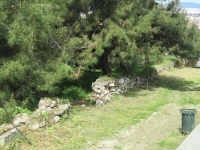 Hadrian's aqueduct near and in the Agora has been studied extensively: after it left its tunnel at the foot of the Acropolis, it crossed the Panathenaic way, made a sharp turn from west to north, entered a settling basin and continued on a substruction and later on on a series of piers, running west of the Panathenaic road. 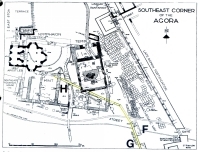 Arriving in the SE corner of the present Agora, it made a soft bend to the west, skirting the nymphaeum east of the Church of the Holy Apostles, and continued in the direction of the SW fountain house (which was already destroyed in the siege of Sulla in 86 BCE). Note that the levels of the channels on both the Roman aqueduct bridges in Neo Ionia - the so-called Kapodistrias and the Perissos bridges - were too low to be part of Hadrian's aqueduct. 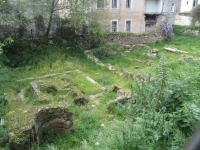 Probably they served the late Roman aqueduct (4 - 5th c CE), see the separate entry on this site. 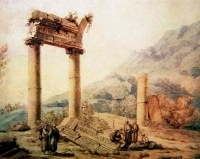 Hadrian's aqueduct and reservoir were the main sources of water for the city of Athens in the years that followed. 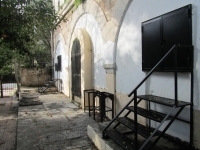 It operated without change until the time of the Turkish Occupation (which began in 1456). From this point on, the Roman aqueduct and reservoir were left to deteriorate. 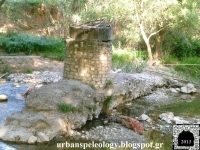 The retreating Turkish Army destroyed many water supply works during the war for the liberation of Greece (1821). 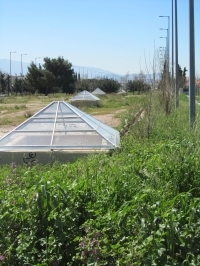 Hence, at the time of Athens' liberation in 1830, the city's water supply problem was critical and demanded immediate attention. 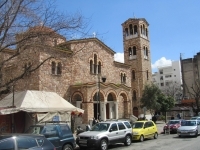 The new city authorities commissioned a number of projects to rebuild and renovate existing local water supply works, such as the ancient Hadrian aqueduct system: in 1847 Athenian workmen began digging at Agios Demetrios church in Ambelokipi. 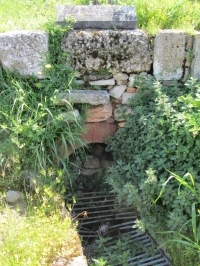 Their goal was to increase the flow of what they thought was a natural spring. 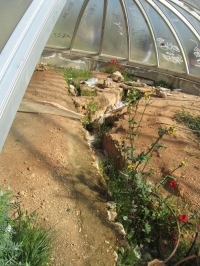 They discovered that the water was coming from an underground aqueduct (Leigh 1997, 279). 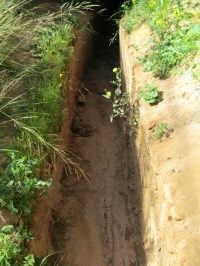 The aqueduct was cleaned of accumulated debris, repaired, and put into operation again. In 1870 the remains of the Hadrian Reservoir were uncovered and a new reservoir was built in its place with an increased storage capacity of 2.200 cubic meters of water. The new Hadrian reservoir operated up until 1940. 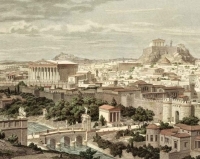 However none of the above endeavors provided a real solution to Athens's water problem. 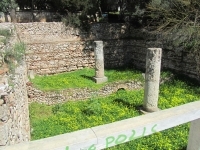 For almost 100 years after the liberation of Athens, the city of Athens continued to depend on wells and other local sources for water. With the huge influx of refugees from Asia Minor in 1922, Athens underwent again a sharp increase in population that had a devastating effect on the city's water supply. 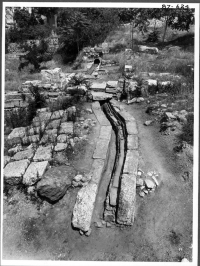 In 1925 an American company by the name ULEN was commissioned to renovate and increase the water supply capacity of the Hadrian aqueduct system, as well as to construct a new water supply system for the Athens and Piraeus area. The first major project was the construction of the Marathon Dam (1926-1929).